There are no photos with those IDs or post 26767 does not have any attached images! One more year these dates are coming so marked in the calendar, we provide all the available information of religious acts in Gijón, Luarca, Llanes and Ribadesella. Solemn Procession of the Way of Calvary. 20.00 h. Exit of the Steps of Jesus Nazareno and Verónica of the Church of San José. 20.30 h. Exit of the steps of the Sorrowful Virgin and San Juan Evangelista of the Church of San Pedro Apóstol. 21.00 h. Ceremony and Sermon of the Encounter in the Plaza del Marqués. Solemn Procession Via Crucis of the Holy Christ of La Misericordia and the Martyrs. 20.00 h. Departure from the Church of San Pedro. Solemn Procession of the Holy Entombment of Christ. 20.00 h. Departure from the Church of San Pedro. Procession of the Soledad de María. 9.00 h. Departure from the Church of San Pedro. Solemn Easter Vigil. 20.00 h. St. Peter's Church. 11.45 h. Step of San Pedro Apostle: Church of San Pedro. 12.00 h. Passage of the Virgen de la Alegría: Chapel of Solitude. 12.00 h. Passage of the Resurrection: Basilica of the Sacred Heart of Jesus. 12.45. Meeting of Resurrection. Campo Valdés. From 18 to 21 for April. Main Square. From 11: 00 h. to 15: 00 h. and from 17: 00 h. to 21: 00 h. Sunday closes at 20: 00 h.
Activities: "Elmer visits the market": storytellers, workshops, photocall ...; decoration of Easter eggs; Demonstration workshop for the production of stained glass. · Holy Week market. From 13 to 21 for April. Paseo de Begoña. From 18 to 21 for April. Muséu del Pueblu d'Asturies. From 12: 00 h. to 22: 00 h. The 21 Sunday of April closes to the 17: 00 hours. Price: 6 € (Espicha abierta). Under 9 years, free. · Palm Sunday: blessing of the bouquets in the park and popular procession of La Borriquilla. 12 hours. · Holy Wednesday: procession of the Christ of Forgiveness, 21: 30 hours. · Holy Thursday, 21: 30 hours, procession of the Nazarene, will initiate its return to the Watchtower. 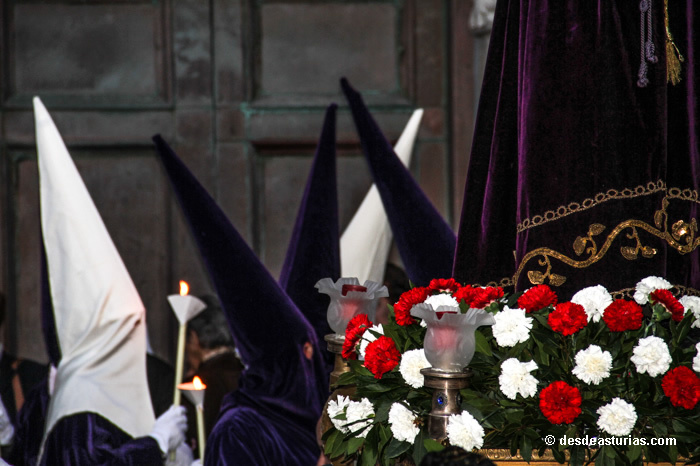 · Good Friday: Procession of Santo Entierro, at 20 hours. · Holy Saturday: procession of La Soledad, at 7.30 hours, and that of the risen Christ, at 21.30 hours.